>I like this dish because it’s simple to make, heavy on the healthy veggies, low on the carbs, nearly fat-free, and is spicy/salty/hot when I’m sick or depressed. I often make it super late at night after derby practice. Couldn’t eat very much of it yesterday because I’m so sick, but it was a nice attempt. 1) Heat water in a big pot. 2) Mix in miso, tom yum paste, sriracha. Taste to see if your broth is salty/flavorful/spicy enough and adjust accordingly. 3) Add mushrooms and allow to hydrate while liquid comes to a simmer. If carrots are chopped add here. 4) If carrots are shredded add here along with noodles. 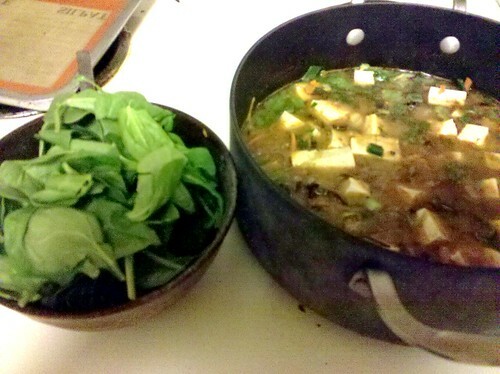 5) Add tofu, scallions, cilantro. Return liquid to a simmer.Turn off heat. 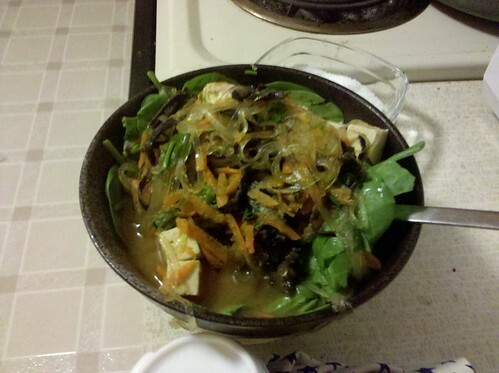 6) Fill a soup bowl with a ton of raw spinach. Spoon hot soup over the spinach leaves and they will wilt from the heat. Stir. 7) Sprinkle w/ Furikake to taste. Shown here before wilting spinach. ps. 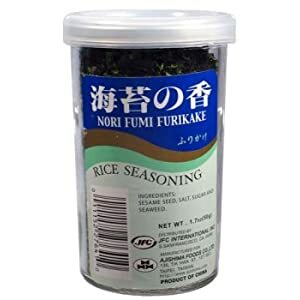 Furikake is a mixture of dried seaweed, salt, sugar, and sesame seeds. It’s often sprinkled on sushi or rice in Japanese cooking to add a little extra flavor. There are many different varieties available in the sushi section of your local Asian market, but be sure to read the label because many of them contain fish. Fish additives to watch for are bonito, saradine, salmon, shrimp. Furikake is a shake and is very similar to gomasio.